I’m feeling better today. I’m not at 100 percent, but I am on the mend. Thank you for all the get well wishes!!! The other day I found a set of Elegant Writer markers in my desk. Amazingly, they aren’t dried up even though they must be over ten years old!! I have seen some really neat drawings done with these and folks posting about how the ink dissolves into surprising colors when water is added over it. Curious, I couldn’t resist trying mine out with a quick scribble of one of the walking paths near our home. The ink line dissolved nicely when touched with a water brush. The line didn’t completely disappear and the ink wash was easily managed. Unfortunately, my black marker did not dissolve into the neat purples and greens I’ve seen other folks get from the Elegant Writers. Maybe it was because mine is soooo old and they used a newer version with a different ink formulation? Has any one else tried the Elegant Writers and water? Did you get spiffy colors or just grey as the ink dissolved? I asked R2 and R4 for help naming this sketch. R2 threw out ‘Into the Woods’. After we all finished singing a few verses of the song, R4 came up with ‘Walk with God’. Perfect for A Pilgrim’s Draw!! 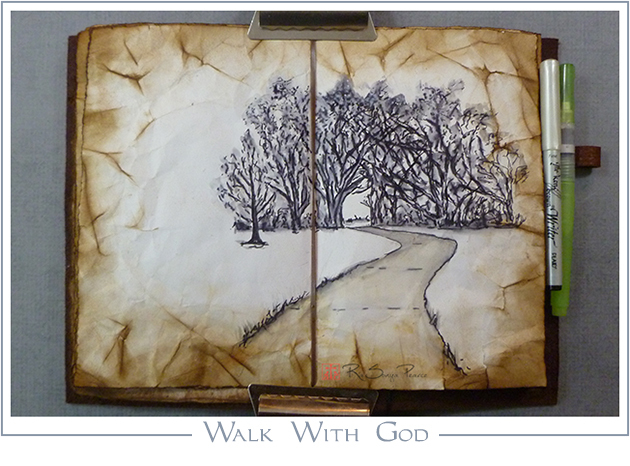 Beautiful page and path to walk!! Thank you! We are blessed with several lovely trails near our home. Lovely! I like the title too.